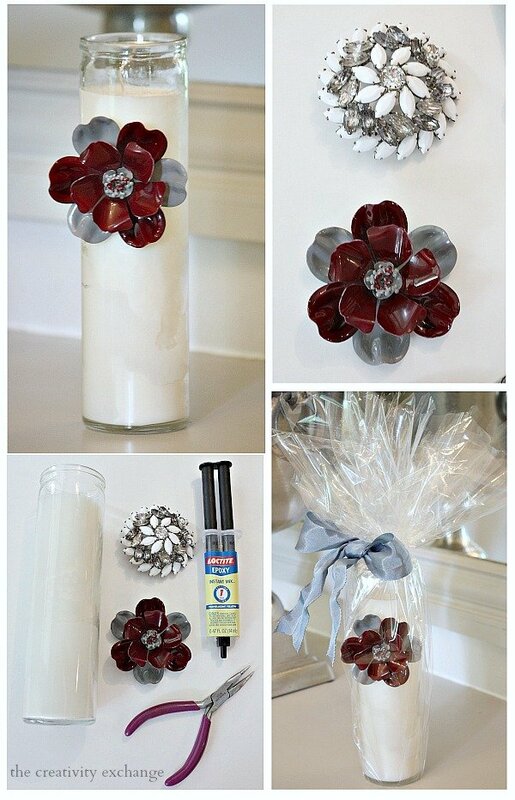 With Mother’s Day coming up this Sunday and this week being Teacher Appreciation Week, I wanted to share one of my favorite easy and quick DIY projects. 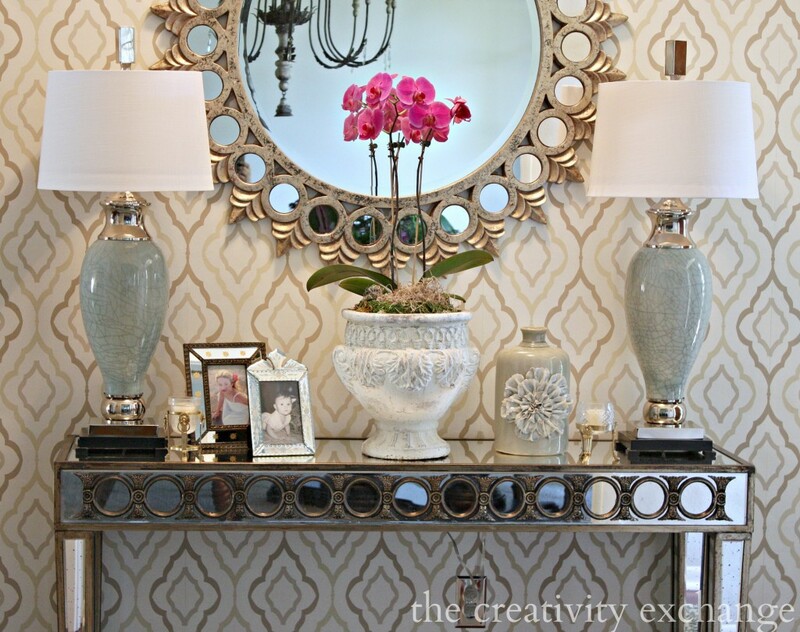 You won’t believe how easy this project is and in just a few minutes, you can create something really unique that anyone would love to receive. 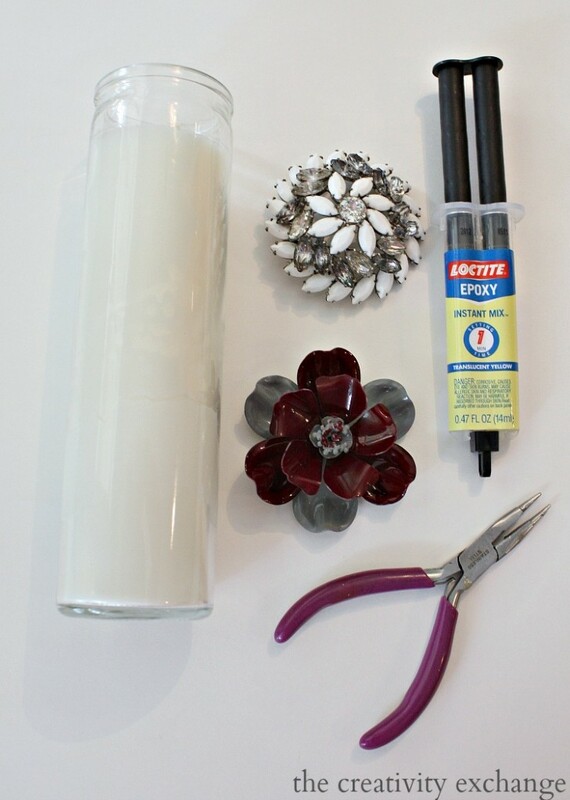 Whether you attach a vintage pin/brooch to a candle or any kind of glass container, the instructions for this project are the same. 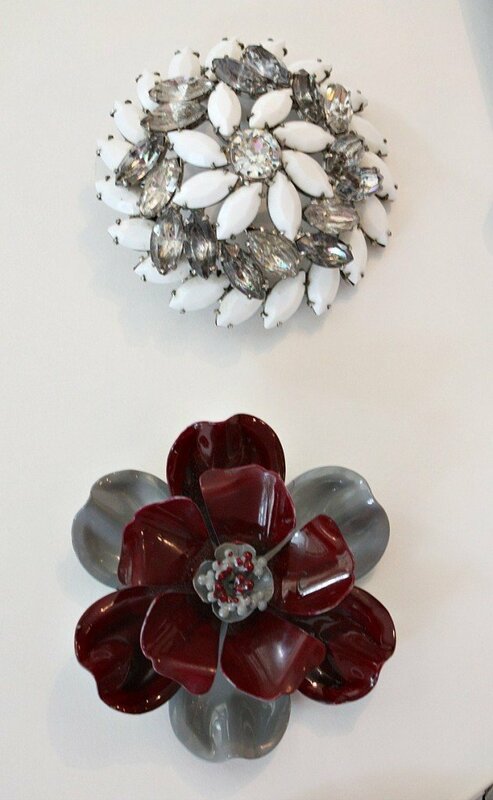 Thrift stores and Goodwill are a great place to pick up vintage pins at great prices. My Goodwill store keeps a basket by the register with old pins for $1.00. I love the big 60’s looking enamel flower pins and I also love the fin old rhinestone ones too. Any style will work. I like the dollar store offertory candles because they look so cool with the big pins. 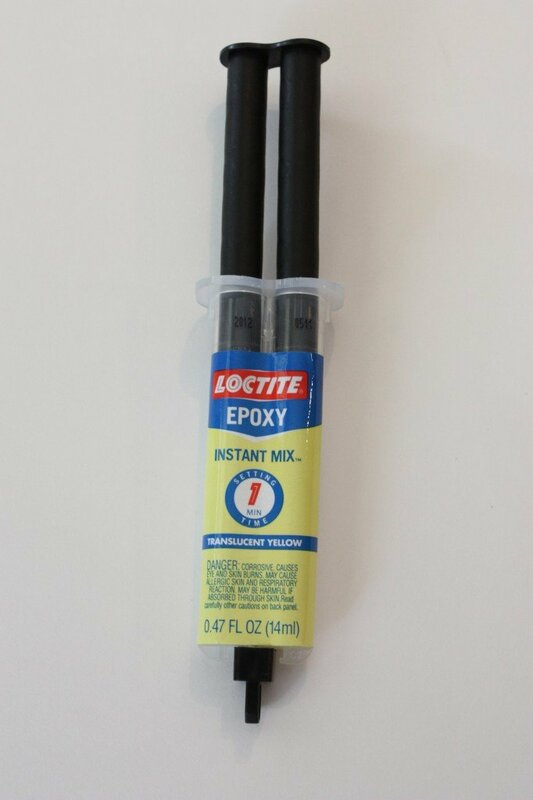 I have tried every kind of glue imaginable and while I use to use E600, I now swear by Loctite Epoxy for gluing things to glass. Trust me, this stuff seriously works the best! You can pick it up at Lowe’s or Home Depot. You’ll need some needle nose pliers that will also cut and you’ll also need an old pin/brooch. My motto is the bigger the better! The first step is to turn the pin over and either twist off or snip off the pin attachment so that the back of the pin can sit flat onto the glass. After you get the pin back off, you’ll need to clean the area that you are going to glue with alcohol and then dry it off. Let it sit for 15 minutes. 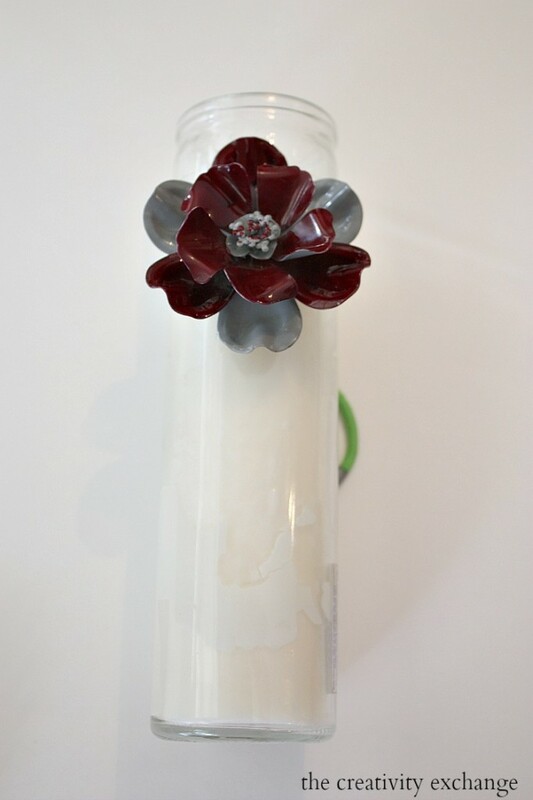 It doesn’t take long for the epoxy to dry but I still always allow about 4-6 hours before I wrap up the candles just to be safe. Trust me, those pins will never come off with this epoxy! 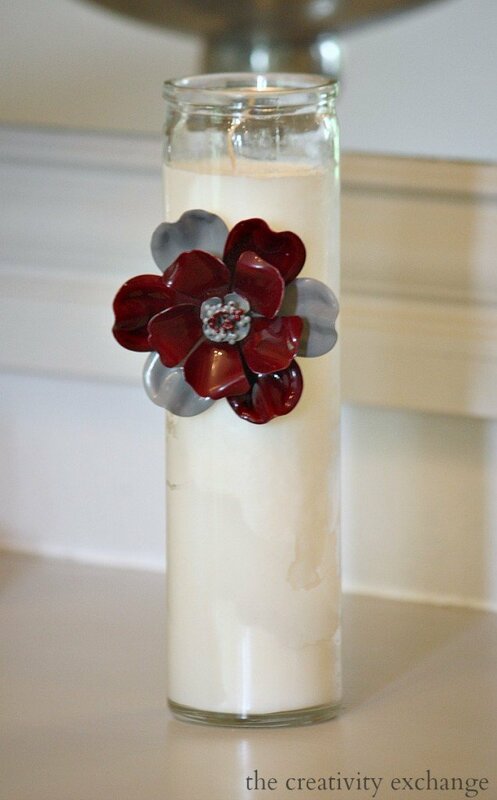 As you can see, these pretty candles take very little time to make and the possibilities are endless! 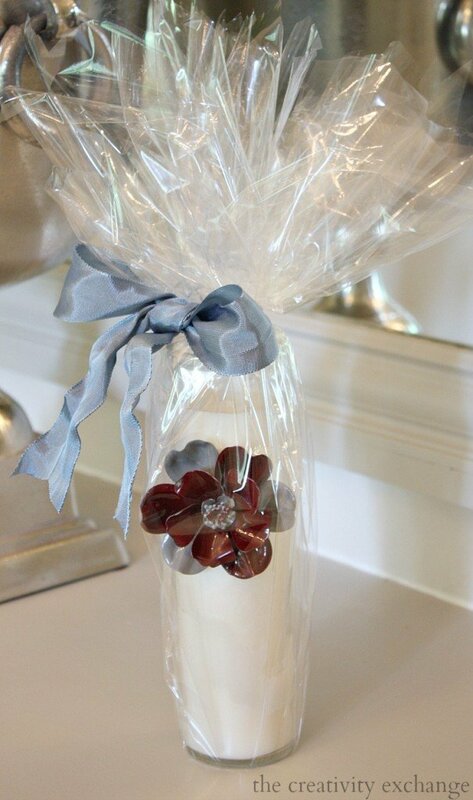 Think of glass containers with pretty soaps or jars filled with bubble bath. Thanks so much for stopping by. By the way, if you happened to miss Monday’s post, I finally finished all my entry way projects and shared the final reveal and details here. How pretty. What a wonderful gift idea!!! 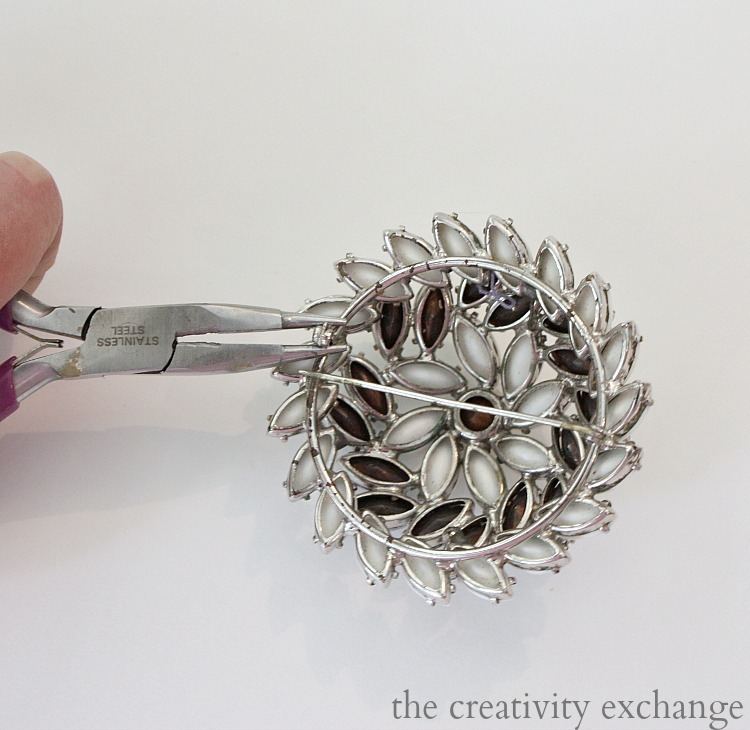 Well…I just couldn’t bring myself to deface an old brooch! I love them, have collect them for years and wear them!! Thanks so much for sharing – what a beautiful and thoughtful present and hardly any time or money to make. thank you Debbie! No time at all to make! I didn’t share a picture but I did a set of glass apocathery jars with black and crystal rhinestone pins too. So fun and easy!